The author of The Elements and the "Gray Matter" column at Popular Science here follows up Theo Gray's Mad Science: Experiments You Can Do at Home, But Probably Shouldn't with a second collection of wildly entertaining practical demonstrations. 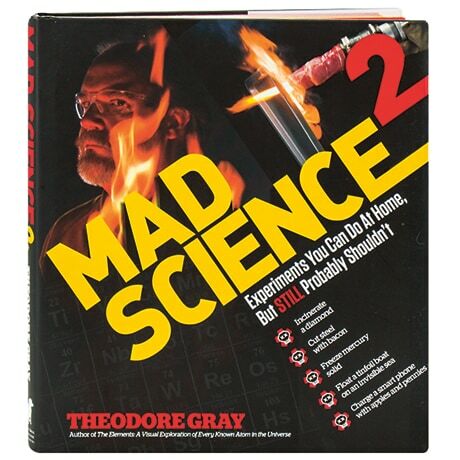 In these dramatic, enlightening, sometimes daring (and always beautifully photographed) science lessons, Theodore Gray dips his hand into liquid nitrogen and his finger into molten lead to explain the Leidenfrost effect, crushes a tomato between two small neodymium-iron-boron magnets to show their extreme attraction, and creates (temporary) trinkets out of solid mercury to discuss states of matter. Here too are a tinfoil boat floating on an invisible sea of gas, a lance made of bacon that's hot enough to cut metal, a smart-phone charger made from apples and pennies, and the eight-step transformation of Pepto Bismol tablets into a ball of metal.